Papers submitted to Üsküdar University Journal of Social Sciences should not have been published or sent for publication elsewhere. For translations submitted to the journal, publication permission of the author and original of the text are required. Translations shall also be submitted to the approval of the referee similar to copy right issues. Page layout should be normal, page set up must be 2,5 cm from top, 2,5 cm from bottom, 2,5 cm from left, 2,5 cm from right, gutter 0, header 25 cm, footer 1,5 cm. Line spacing must be 1.S and 0 pt. except the references. In references, it must be land 0 pt. Page numbers must be placed at the bottom on the right. Language of publication is Turkish and English. Corrections regarding to principles are made by editors/co-editors. The most recent edition of the spelling guide of Turkish Language Institution is taken into account for language use, punctuation and abbreviations. The texts submitted must be clear and understandable, and be in line with scientific criteria in terms of language and expression. In texts which are written in English, there should be a Turkish abstract right after the English one. Abstracts both in Turkish and English, must be no longer than 300 words including the main title both in English and Turkish and 5 key words for both languages. Short version of title of the text should be indicated in the email which is sent to the editor with the article. The main title must be 14 pt.,, bold and all in upper-case. The subtitles should be 12pt., bold and with only initials in upper-case. Name of the author should be 'Times New Roman with a font size of 12 in bold, and should be written under the main title and be centered. Initial of the given name and all letters of the family name should be in upper- case. After surname, superscripted asterisk “O must be added and the information regarding the author must be given by Times New Roman 10 pt and 1 for line space only in the first page's footer as justified. Abstracts and key words should be in italic. Text should be justified, in Times New Roman with a font size of 12. Line spacing should be 1.5, and the paragraphs should start with 1.25 left indent. Footnotes should be justified, in Times New Roman with a font size of 10. Line spacing should be 1 and the text should start with a space after the footnote. The number of the footnote should be given after the punctuation marks within the text. Footnotes should be given numerated below the page; citations should not be given within the text. There should be a space after the footnote number, before the text starts. There is no need an additional space before the upcoming lines. Full identity of the resources cited shall be given; any uncited resource shall not be presented in the references. Footnotes from foreign language sources should be given in respect to English spelling. Footnotes from Turkish sources should be given in respect to Turkish spelling rules. Direct quotes: Direct quotations used within the text should be given by quotation marks (“ ”) and should be cited as suited to footnote system. Quotations less than five lines must be italic and not separate from ongoing text, whereas quotations more than five lines is must be I cm. from the right, and from the left 1,25 cm. (from the point where paragraph starts) indent; it must be italic as a whole unit. For quotations more than five lines line spacing must be 1.15, font must be 11 pt. Examples on footnote notations are given below. Author's name and surname, Title of the work, if applicable volume number and translator, (Place of the publication: Publisher, Date of the Publication), Page number. A. Sırrı Levent, Türk Edebiyatı Tarihi, (Ankara: AKDTYK TTK Yayınları 1988), p.23. Name and Surname of the First Author, Name and Surname of the Second Author, Title of the work, if applicable volume number and translator, (Place of the publication: Publisher Date of the Publication), Page number. Nusret Özcan ve Kemal Aykut, Mustafa Kutlu Kitabı (İstanbul: Nehir Yayınları 2001), p.8. Name and surname of the first author, et al,, Title of the work, if applicable volume number and translator, (Place of the publication: Publisher Date ofthe Publication), Page number. Neclâ Pekolcay et al., İslâmi Türk Edebiyatına Giriş, (İstanbul: Dergâh Yayınları 1981), p.7. “Türkiye ve Dünyada Yükseköğretim”, Bilim ve Teknoloji, (İstanbul: TÜSİAD Yayınları 1994), p.81. 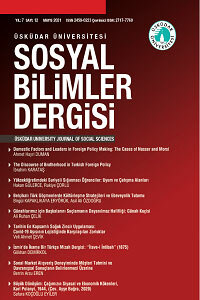 M. Efe Çaman et al, “Yemen: "Yeni Afganistan mı?” in Dünya Çatışmaları Çatışma Bölgeleri ve Konuları, Volume 1, ed. Kemal İnat, Burhanettin Duran ve Muhittin Ataman, (Ankara: Nobel 2010), p-340. Name and surname of the Author, “Title” (translator, if applicable), name of the journal, year of publication, volume number:, page range, page of the citation. Tom D. Lewisand Gerald Graham, “Seven Tips for Effective Listening, British Journal of Social Work, 2003, 13-35, p.30. Michael Stowe et. al., “Required knowledge, skills and abilities from health care clinical managers” perspectives”, Academy of Health Care Management Journal, 2011, 55-62, p.60. “Balkanlarda Türk Varlığı”, Toplumsal Tarih, Volume: X, Number: 7, Mayıs 1990, Ankara p. 8. Add DOI (Digital Object Identifler) number if applicable. DOI number, when added to http://dx.doi. org/ address on a browser, it directs user to the source. If there no URL, add URL. No italics shall be used for headings of non-published 'Theses. Avni Erdemir, “Muslihu'd-din Mustafa İbn Vefâ Hayatı Eserleri Tesirleri ve Manzum Eserlerinin Tenkidli Metni”, Gazi Üniversitesi Sosyal Bilimler Enstitüsü, (Unpublished Ph. D. Thesis), Ankara 1999, 6.30. Fatma Gök, Öğretmen Profili Araştırma Raporu, (Ankara: Eğitim Bilim ve Kültür Emekçileri Sendikası Yayınları 1999), 6.25. Arnavutluk Ülke Raporu, (Ankara: TİKA Yayını 1995), p.7. Ömer C. Saraç, “Kağıt, Milli gelir” Ak İktisat Ansiklopedisi, Cilt:1l, (İstanbul: Ak Yayınları, 1973), ss.20-30. Dritan Egro, “Arnavutluk'ta Osmanlı Çalışmaları” XII. Türk Tarih Kongresi, Bildiriler, 4-8 Ekim 1999, Cilt: 1, (Ankara: TTK Yayını, 2002), s.14. Alev Keskin, 1877-78 Osmanlı-Rus Harbi Harp Tarihi Broşürü, ATASE Publishing, Ankara 2000, p. 7. Yusuf Sarınay, Ottoman Archives and Ethio-Ottoman Relations, Başbakanlık Printing, Ankara 2001. Afyon Kocatepe Üniversitesi Haber Bülteni, (Afyon: Afyon Kocatepe Üniversitesi Yayınları, 1999), 5.8. For the subsequent footnotes to the same source, (author name surname, Ibid.) must be written italic and page number must be written. If certain author has citations for more than one of his/her pieces, then in the footnotes it must be author's name surname, year of publication and page number; if author has more than one piece in same year, then, the letters of A, B, C must be added to the publication year of the piece. This also must be written as it is, in the bibliography. Attachments (documents), shall be presented at the end of the text and down below shall be a brief information as to the content of the document and proper citation in line with the relevant criteria. Other attachments (Table, Figure, Graphs) shall be presented as Additional Table: 1, Additional Graph: 3 and Additional Figure: 7 if indicators other than the text are too many in number; attachments shall be presented after the References. References to these attachments in the text shall absolutely be made as Additional Table: 1, Additional Graph: 3 or Additional Figure: 7. If citation has been made for table, figure, graph or picture, resource shall absolutely be indicated. Tables within the text should be titled in bold on the table, cited source should be given according to footnote rules. Figures, graphs and maps within the text should be titled right under, and cited source should be given according to footnote rules. Bibliography should be written in upper-case and bold, right after the text with two spaces, left aligned and without indents. References should be alphabetically ordered. Line spacing should be 1 and there should be a given space after each reference. Initials of the names and the surnames of the authors should be in upper-case, with other letters in lower-case. The page range of the paper which is published in a book or a journal should be given at the end of the reference. The recent work should be written first, with other works following the same order. Name of the author should not be specified for the second and the following works. There should be ------- mark instead of the name. Publication Board of the Journal sends to two referees of expertise the papers it has found relevant in terms of form and fields for assessment. The paper is accepted for publication if both of the referees are positive. If one referee report is positive while the other one is negative, the paper is sent to at third referee. The papers which have been decided to be reviewed shall be submitted by the author(s) within stated days (including the duration of postal service). The revised text may be re-examined by the demanding referees should the Journal publication board find necessary. The papers submitted shall be published within the final decision of the Publication Board following the “can be submitted” approval of the two experts in the field. Authors shall take into account criticisms, assessments and revisions of the referees and the Publication Board. If the author has any points he/she does not agree with, he/she has the right to specify these issues in a separate page within the justification thereof. The papers, following the approval by the referees, are ordered by the Publication Board, based on dates of completion of referee reports and also based on the scope of the journal. The opinions, thought and proposals within the articles are but reflections of the authors and do not, in anyway, represent those of Üsküdar University.